Off concrete is mainly used for pedestrian areas such as squares, sidewalks, parks and areas where there is the crosswalk. Given its characteristics, it is highly recommended for areas where an anti-slip surface is necessary. This type of soil is thought for outdoor use, and gives a rustic finish. Off concrete composition is similar to the classic concrete with cement, aggregates and water, but the difference in the appearance of aggregates on the surface. 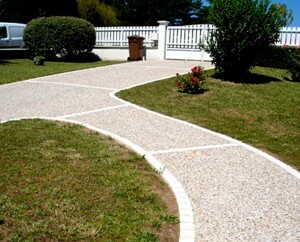 Active concrete is obtained from the ‘application d ‘une material loss which is on top of the concrete, which is then applied a l ‘eau pressure washing. We get this finish by applying a self-timer d chemical ‘inactivation applied on the surface layer, and then the floor is washed with water under pressure, and the surface is coated with resins. Using this approach, you get a soil having a grainy look and feel rough, and we feel like a driveway gravel, without the maintenance required in this type of soil. It is a Surface whose maintenance is easy. Concrete allows customization of its appearance, and its colours, through different types of aggregates and pigments, which allow an endless choice of results. It is extremely weather-resistant and antiskid power makes it ideal for your outdoor. Contact today team Paviart to receive a quote for your disabled concrete floor. http://www.paviart.uk/wp-content/uploads/2017/10/logo-paviart1new-1.png 0 0 adminxc24 http://www.paviart.uk/wp-content/uploads/2017/10/logo-paviart1new-1.png adminxc242016-12-05 11:15:392016-12-05 11:15:39What is that concrete disabled?